The 2010-2011 State Officer Team is here to provide you with the tools you need to excel in today's world! Whether it's through chapter visits, over the phone, or even Facebook, we are here to assist our members in reaching their fullest potentials. Future Business Leaders have the reputation of being the best and the brightest. Maryland Future Business Leaders plan on Breaking Barriers! and soaring above the competition at the National level! We look forward to a productive year, and hope to see everyone at the Leadership Conferences! with your 2010-2011 state officer team. Faith Katsman's initial involvement with FBLA was during her Freshman year as a member. Her high school hosted the regional conference, and she had the opportunity to see the state officers in action. It was at this point she realized she wanted to become more involved in FBLA. Each year Faith took on more responsibilities such as being chapter President from 2008-2010, and Region IIC Vice President during the 2009-2010 year which culminated into the State President position. Faith is excited to work with the outstanding State Officer team in reaching the many goals she has for the 2010-2011 year. In the 2009-2010 year Maryland FBLA Reached Epic Heights; this upcoming year Faith hopes to reach ever higher and Break Barriers with Maryland FBLA! Karthik Krishnan is humbled and honored to serve as your 2010-2011 Maryland State Executive Vice-President! Karthik’s journey in FBLA began his freshman year at River Hill High School in Clarksville, Maryland. He has been actively involved for the past four years and is excited to close out his journey this year with you all. In addition to serving as Maryland State EVP, Karthik also serves as his Local Chapter President and as the 2010-2011 FBLA National Treasurer, the first FBLA National Officer from Maryland in nearly 5 years. Karthik looks forward to representing Maryland FBLA at the National Level as we continue Breaking Barriers! together. William “Jack” Fitzpatrick is a Junior at River Hill High School. He is very excited and honored to serve as the 2010-2011 Maryland State Secretary-Treasurer. He has been heavily involved in FBLA since his freshmen year. Additionally, He serves as his Local Chapter Vice-President. Jack has attended two State Leadership Conferences and two National Leadership Conferences. Besides FBLA, he is involved in River Hill’s Student Government Association, River Hill Madrigals, and serves as the Chapter President of River Hill Best Buddies. Through FBLA, Jack Fitzpatrick has become a stronger leader and has gained numerous other skills. He believes that Future Business Leaders of America is an organization where the possibilities are endless. Jack is a motivated person who is ecstatic to help Maryland FBLA Break Barriers in the 2010-2011 school year! Vivian Tu is currently a junior at Marriotts Ridge High School in Marriottsville, MD. She is proud and honored to serve as the 2010-2011 Maryland FBLA State Reporter-Historian! Vivian hopes to increase statewide communication, membership, and participation in events offered by Maryland FBLA, as well as National FBLA. She loves competing in FBLA and has placed at the National Level. Aside from FBLA, Vivian is also the Co-Captain of the Marriotts Ridge Model UN Team, a Math Team member, and the Captain of the Marriotts Ridge sector of the It's Academic Quiz Bowl. 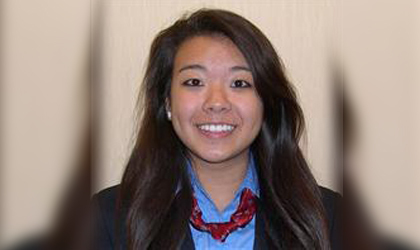 Since joining FBLA in the 9th grade, Vivian has learned many skills and made numerous friends. She now plans to Break Barriers with your help and the help of your 2010-2011 State Officer Team! As a senior at River Hill High School, Govin Vatsan has spent the past four years heavily involved in FBLA. He has attended numerous Regional and State conferences in addition to two National Leadership Conferences. Through FBLA, he has become bolder both as a leader and a person, and he is honored to be currently serving as Maryland State Parliamentarian and Chapter Co-President. Outside of FBLA, Govin is involved in Tang Soo Do Karate, the Technology Honor Society, and the National Honor Society. He is amazed by the opportunities that FBLA has provided him, and is ready to go further and Break Barriers! through the 2010-2011 school year! Randi Waller is a senior at South Hagerstown High School in Hagerstown, Maryland. Randi has been a member for FBLA for 4 years, she has competed and placed in Accounting II & Job Interview at the regional and state levels. She is an active member in her local chapter and the student body, she servers as her chapter's President, a member of the community service committee, as well as the fundraising committee. Randi is a member of the varsity cheer-leading squad, varsity wrestling team, and track team. She is always lending a helping hand. She enjoys helping others and spending time with family and friends. Ashley Dorsey is currently a junior at Chopticon High School and is proud to serve as your Region IV Vice President. Ashley was first introduced to FBLA her freshman year as a member of the Academy of Finance. Since then she has taken on the task of Historian in her local chapter for the past two years. Through FBLA, Ashley has recieved a great deal of business and leadership skills she will be able to use in the future. Outside of FBLA she is a member of her school's Academy of Finace and International Club. Her goals as a Maryland FBLA officer include getting more members more involved in FBLA activities and increasing membership through out the state. Ashley looks forward to a great year of Breaking Barriers with Maryland FBLA. Samantha Still is a senior at North Harford High School. She has been an active member of FBLA for three years. She is also a member of National Honor Society, National Art Honor Society, and Spanish Club, as well as various other extracurricular activities. Samantha is currently the FBLA President for her local chapter. She aspires to pursue a career in business. Shirley Zhu is excited and honored to serve as your Region 8 Vice-President! Shirley is currently a junior at North County High School's STEM Magnet Program in Glen Burnie, MD. She joined FBLA her freshman year to enhance her leadership skills and has remained an active member. This year, Shirley is her local chapter President, but she has served as local chapter Vice-President, as well as the Secretary of the State Project Development Committee during the 2009-2010 school year. Her goals include increasing membership, activating more chapters, and encouraging all members to attend state and national conferences. Shirley is looking forward to a great year Breaking Barriers with Maryland FBLA! Tim Fisher, a junior at River Hill High School, is excited and honored to serve as your 2010-2011 Region 9 Vice President. He began his FBLA career as a freshman and has since become a Regional Vice-President’s Assistant, and the Vice-President and President of his chapter. He placed fourth in the nation for Business Presentation at the National Leadership Conference in July. Outside of FBLA, he is a member of the Cross Country and Track and Field teams, and is the President of his chapter of the Junior Statesmen of America. He looks forward to organizing the first ever Region 9 Conference, and is committed to making it a successful and memorable event. He hopes that all Maryland FBLA members will join him in Breaking Barriers this year!